The round of 16 of Brazil’s domestic cup competition, the Copa do Brasil, got underway this midweek. For the first time, clubs that were involved in this year’s Copa Libertadores have been allowed to participate, making this the Copa’s most cut-throat edition yet. The idea of a national cup competition is a fairly new one in Brazil, down in part to the size of the country and the local importance once placed on the waning state championships. However, winning trophies is a fundamental piece of the Brazilian football fan’s psyche, and any competition that allows a club to lift some silverware after only a handful of matches will always have a place in Brazil’s football calendar. For the less superficial, the Copa do Brasil is still an inviting prospect for clubs. The winner of the tournament earns a place in the group stages of the following year’s Copa Libertadores, and the only other way for Brazilian teams to qualify for the continent’s premier club competition is to finish among the top four in the national championship, the Brasileirão. Therein lays one of the main problems with the Copa do Brasil: its impact on the Brasileirão. South American football clubs have an inherent problem with juggling multiple competitions at once. Whether by choice or by lack of squad depth, South American sides in general can only focus on one tournament at a time. Mid-table or bottom half teams may well abandon their league exploits and go all in on the cup, a far-more realistic avenue towards Libertadores qualification. This particular strategy has its risks, however. If a club was to ignore their results in the league in search of a cup win, one contentious red card or a late goal in the final could throw their entire season into turmoil. The Brazilian league calendar is extremely bloated and just a few weeks of bad form is enough to plunge teams into crisis. Even winning the cup has its dangers. Palmeiras, last year’s champions, completely shifted their attentions towards the Copa do Brasil and away from the league. By the time their title celebrations had died down, they realised that they were entrenched in the relegation zone. More and more league fixtures came thick and fast and struggling to build up any momentum, the cup winners were relegated to Série B.
I was at the first leg of Palmeiras’ last 16 tie against Atlético-PR on Wednesday night and the mood on the stands was altogether positive. This year, Palmeiras are in the unique position of being able to prioritise the Copa do Brasil while standing a good chance of winning the Série B even with a reserve side. With less pressure on their league form, Palmeiras could conceivably go far in this year’s tournament. Their defensive situation is troubling though and they are conceding far too many goals, especially from their left side. Left-back Juninho has had a good start to the season and his efficiency in attack has improved considerably, but he has never been a particularly good defender. He doesn’t track back well and often leaves vast spaces behind him for the opposition to exploit, and Palmeiras do not have any centre-backs sufficiently adept at covering these gaps. Had Atlético been more clinical in front of goal, they would have won on Wednesday evening. As it was, Palmeiras scored early and held on to their 1-0 lead until the final whistle. Later that night, Luverdense’s surprise 1-0 win against world champions Corinthians highlighted another problem with the Copa. Unlike the majority of domestic cup competitions around the world, each round of the Copa do Brasil is contested over two legs. The concept of a giantkilling, of the unpredictability of the cup, is unheard of in the Copa do Brasil, because upsets have been made virtually impossible. Luverdense, a club less than ten years old from the city of Lucas do Rio Verde in the central-west state of Mato Grosso, sat deep in their own half, frustrated Corinthians and managed to win 1-0. But what should have been a heroic scalp will have been for nothing, as Luverdense are likely to be soundly beaten in Wednesday’s second leg in São Paulo. The idea of a knockout competition is that the best team doesn’t always win. The cup should award daring and guts, not consistency. Brazil already has the Brasileirão, which determines the best team in the country over 38 rounds. An honourable mention must go to Botafogo’s 19 year-old midfielder Vitinho, who led his team to a 4-2 victory against Atlético-MG in the Maracanã on Thursday evening. With no Clarence Seedorf to organise the play (the Dutchman was ruled out through injury), Botafogo struggled in the first half and were picked off on the counterattack by their opponents. Vitinho then took it upon himself to drop deeper and play the “Seedorf role”, constantly looking for the ball and serving as a reference for Botafogo’s fluid attacking system. The teenager had a hand in all four goals, scoring the final one himself. Vitinho has already made a huge impact this season and looks to be a magnificent talent. He is comfortable beating players on either side and he has a great creative instinct, able to cut in from the left and make things happen. He has been working hard on improving his technique and has developed a wicked shot from the edge of the area with either foot. Under the guidance of Seedorf, Vitinho could be about to fill the gap left by Neymar, Lucas, Wellington Nem and Bernard as the league’s next big thing. After six rounds, the Brasileirão table has yet to take shape. Many sides are struggling for form, with only four teams in the top ten winning their matches this weekend (and only one in the top five). However, it comes as no surprise that Oswaldo de Oliveira’s Botafogo are leading the way. The current Rio de Janeiro state champions possess three qualities fundamental to form a good team. Firstly, they have an effective tactical system; secondly, they have players with the relevant characteristics and qualities to fit into that system; and finally, they have formed a cohesive team unit. Botafogo defeated Fluminense yesterday in the clássico vovô thanks to superior strategy. Against the current Brazilian champions, Bota were content to position themselves deeper on the pitch, tightly marking Fluminense’s midfield and full-backs and allowing their centre-backs to remain unchallenged, but without any passing options. For years now, Flu’s game-plan has been dependant on the support they receive from the flanks. Their two full-backs, Carlinhos and Bruno (Mariano, in 2011), are the most attacking in Brazilian football and it is their energy and attacking thrust that has so often tipped the balance in Fluminense’s favour. On Sunday that supply line was cut, and Fluminense ran out of ideas. Centre-forward Fred confirmed this after the match, suggesting that they played too much of their football through the middle of the field. Botafogo sealed the 1-0 win with a lovely right-footed strike from Clarence Seedorf, and in the end they were good value for the three points. Seedorf’s Brazilian adventure is now just over a year old, and in that time he has made such a profound impact on this Botafogo team. When Seedorf first arrived from Milan, head coach Oswaldo de Oliveira was worried that he would not be able to fit him into their system. However, after a bit of trial-and-error, Oswaldo stopped trying to fit Seedorf into the system, and instead adapted the system to fit around Seedorf. 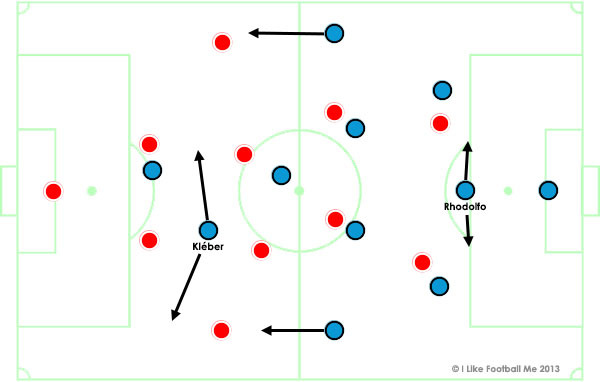 The Dutchman is the number 10 in Botafogo’s 4-2-3-1, but as he pushes forward or drifts wide, the other three attackers instinctively reposition themselves around him, still managing to maintain their attacking shape. This way, Seedorf has more freedom, he is involved more in the match, and the opposition never get the chance to man mark. At this point, Botafogo is among the strongest and best prepared sides in Brazil, along with Corinthians, Atlético-MG, and at a stretch, Cruzeiro. That is no guarantee that they will form the top four come the end of the season, though. The Brasileirão is a gruelling campaign, with a high volume of games in a short space of time. Often, staying injury free is half the battle. In Série B, Palmeiras were impressive in their 4-0 home win against Oeste. The match saw the return from injury of Chilean playmaker Jorge Valdívia, who has been perpetually out of action since returning to the club in 2010. In these past three years, Valdivia has featured in 92 matches for the club, missing 110 through injury or suspension. On Saturday however, Valdívia was playing with a point to prove. The Chilean was instrumental in all four of Palmeiras’ goals (including a wonderful passing move for goal number three) and was roundly applauded when substituted in the second half. Palmeiras coach Gilson Kleina altered his team’s system slightly for Valdívia’s return. For most of the match, Palmeiras operated in their usual 4-3-1-2 shape, with Valdívia as the enganche, however when wide forwards Vinícius and Leandro worked back to mark, Valdívia was left as the furthest man forward, in a shape resembling a 4-3-3. Having Valdívia in the line-up, accounting for the majority of the creative workload, all of Palmeiras’ other attacking players gave better performances, Wesley in particular.